Please check out each individual page under the Resources section to download free resources to use with your children to help them practice their math skills. I would love to hear how you are using my books, resources and ideas with your children. Please visit the Contact Me page and let me know. 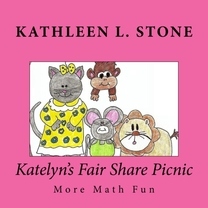 Katelyn's Fair Share Picnic introduces children to division as sharing groups of food items. Research shows that the sharing division model is a relatively easy concept for young learners to grasp, partly because the language of division is familiar to them when presented as creating equal size groups. Presented in this manner, children are also able to see how division and multiplication are related. The last illustration of the book is an opportunity for children to problem solve how they would share twenty cookies now that there are five friends!